Cheteshwar Pujara is a name we had better get used to seeing a lot. Already in this series he has batted for more than 15 hours against England, without being dismissed, and looks set to add more tomorrow. England will take heart from day one of this Test, especially having lost the toss once again, but after having the home side 169/6 they let the initiative slip as an unbroken stand of 97 for the 7th wicket between Pujara and Ravi Ashwin took India to a score already above par. Monty Panesar made a stirring return for England, the pick of his four wickets this morning being one that pitched on leg and ripped to hit to top of Sachin Tendulkar’s off stump, prompting a stunned silence from the ever-expectant Indian fans on their master’s home ground. The Wankhede Stadium may be feeling more like a home for Ashwin however. He finished 60*and also struck his only Test century to date on his last appearance here against the West Indies. His efforts today will certainly restore some confidence after his second innings struggles in Ahmedabad. The amount of turn on display was not a surprise, but will be a concern for England especially seeing that Umesh Yadav has been replaced by Harbhajan Singh – a man with 406 Test wickets to his name already – to go alongside Ashwin and Pragyan Ojha in the Indian line-up. Their powers of concentration will be tested to the max this time around. The changes in the England line up were much as expected; Jonny Bairstow replaced Ian Bell while Panesar came in for Tim Bresnan. Stuart Broad struggled desperately once more however going at five-an-over in his 12-wicketless overs. There was some joy for James Anderson, getting one to swing and trap Gautam Gambhir with just the second ball of the day, a rare victory for an England seamer this winter. 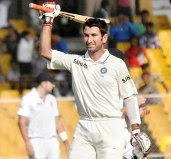 The early wickets were a false dawn for England however, as Pujara further cemented his reputation. Averaging 71.25 in his first six Test matches, this is a player with all the attributes to succeed both and home and abroad. England twice came close, Anderson putting down a tough chance in the gully when he was on 60 and when on 94 the ball flicked up of the boot of Alastair Cook at short leg to be caught, but was deemed to have hit the ground as well. On the surface a score of 266/6 looks like a decent effort for England, but it could have been so much better if it were not for the new wall in the Indian batting order.